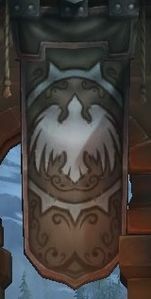 Unlike most other Human Kingdoms with the exception of Dalaran, Kul Tiras never developed into a hereditary monarchy with a King and Queen. 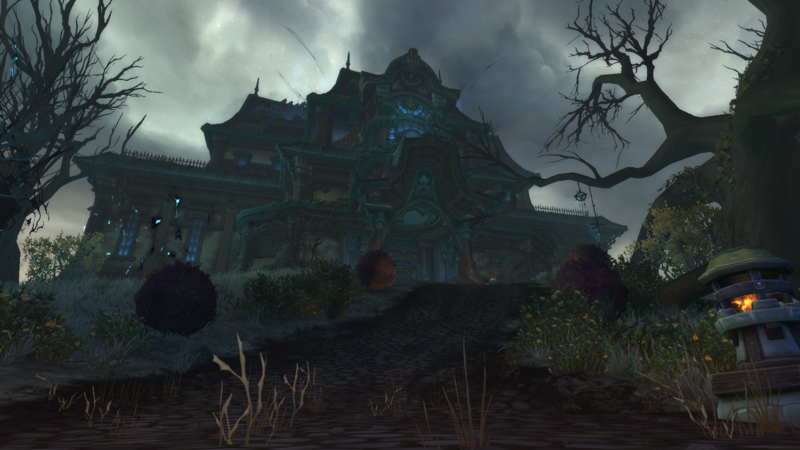 Instead, Kul Tiras is ruled by Noble Houses, each of which controls a certain aspect of Kul Tiran society and together form the governing rule of Kul Tiras. In this tome we shall cover the various Noble Houses, their areas of influence and their place within the power structures of Kul Tiras. 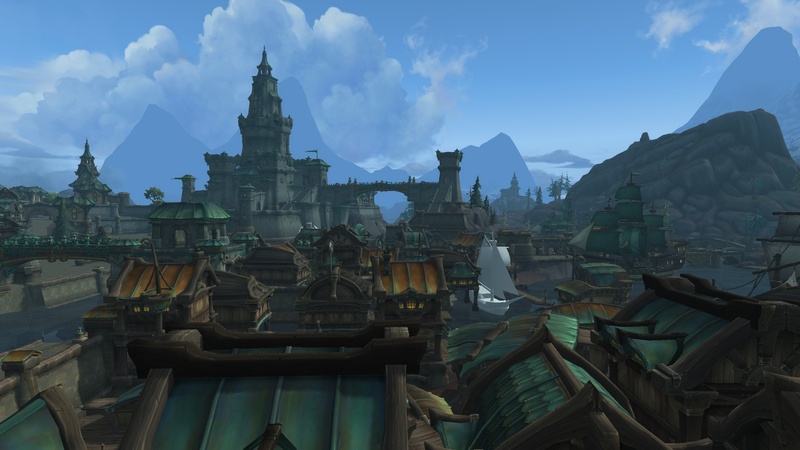 House Proudmoore is the most powerful of the four noble houses of Kul tiras, and used to split power with House Ashvane in the capital city of Boralus along the shores of Tiragarde Sound. It's seat of power at Proudmoore Keep in the capital of Boralus. Through the Proudmoore Admiralty, House Proudmoore commands the Kul Tiran Navy and Marines - providing for the safety and defense of Kul Tiras. 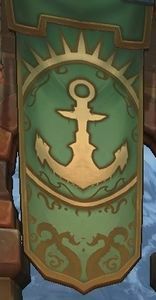 The Coat of Arms of House Proudmoore shows a Golden Anchor on a sea of green radiating with light. 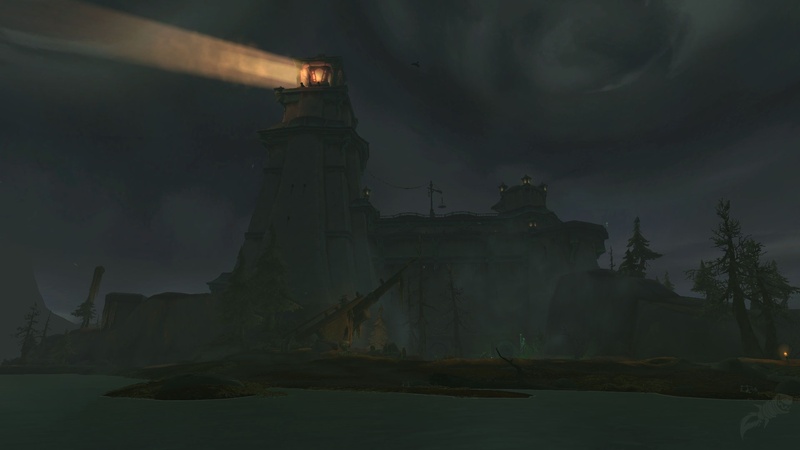 This is a depiction of the Lord Admiral's Pendant being used as a beacon to call the Kul Tiran fleet home. Lady Katheirne Proudmoore, who had ruled as Lord Admiral since the death of Lord Admiral Daelin Proudmoore at the end of the Third War, has recently adbicated the position of Lord Admiral of Kul Tiras to her daughter Jaina after she rescued the Kul Tiran fleet and returned them back home. Jaina's intervention came just in time to thwart the coup attempt by Lady Ashvane, forcing her surrender and thus ending the Siege of Boralus. Lady Jaina Proudmoore rising to the position of Lord Admiral has proven to be a challenge for some Kul Tirans who still blame her for the deaths of so many at Theramore years ago, and accepting her as ruler after having spent years despising the so-called "Daughter of the Sea" is difficult. Lady Jaina Proudmoore had lived in exile from Kul Tiras after her direct involvement in the death of her father at the hands of the Horde during the first Siege of Theramore in Durotar at the end of the Third War. While so many Kul Tirans are still uncertain about Lady Jaina, her recent actions to save Kul Tiras from internal threats as well as the leadership she has shown since her sudden rescuing of the Kul Tiran fleet (along with all the sailors onboard who's family had thought them dead) has allowed Kul Tirans to see her in a new light - and perhaps earn back the respect she lost so many years ago. In these uncertain times and with Kul Tiras having just rejoined the Alliance as we come under attack by the Horde, we look to House Proudmoore and to Lady Jaina to help us weather this storm and see the Horde pay for their aggression. House Ashvane used to share control of Tiragarde Sound with House Proudmoore. Commerce and the merchant marine of Kul Tiras were formerly controlled by House Ashvane, wielding considerable economic power in the nation. Lady Priscilla Ashvane was the ruler of House Ashvane. Her husband, Lord Ashvane, died in Theramore alongside Grand Admiral Daelin Proudmoore during the Horde's first siege of Theramore at the end of the Third War. The Ashvane Trading Company once held almost all of the official state contracts for trade and manufacturing. They had steadily amassed power since Grand Admiral Daelin Proudmoore's passing, and were the largest employer in Kul Tiras. Even before Lady Ashvane's coup plot was exposed, most Kul Tirans believed House Ashvane to be corrupt, but without concrete evidence, Justice could not be brought to bare. Lady Ashvane was the mastermind of a plot to overthrow House Proudmoore and take control of Kul Tiras by allying herself with the Irontide Raiders - providing them with Azerite weapons and ammunition which the pirates used to destroy Daelin's Gate and lay siege to the capital city of Boralus. All assets of House Ashvane have been seized by the House Proudmoore, though many fugitives who conspired with Lady Ashvane remain at large. during her stewardship of the prison. House Waycrest controls the Drustvar to the west, a mountainous region rich in ores and minerals, and with expansive forest lands which supply much of the lumber used in the construction of Kul Tiras' legendary fleets. 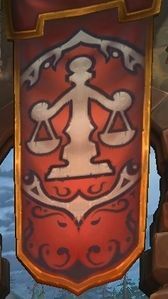 Lord and Lady Waycrest were also recently deposed by their daughter Lucille Waycrest with the help of Kul Tiran forces, the Alliance and the newly reformed Order of Embers. Many of Kul Tiras' mightiest warriors hail from Drustvar. The Waycrest family have been strong supporters of Proudmoore rule for centuries, running their affairs from Waycrest Manor in Drustvar. House Waycrest led the war against the indigenous Drust when humans from Gilneas first arrived on the shores of Kul Tiras thousands of years ago. through a sea of brown. Falconry is a time-honored tradition in Drustvar. The two rulers of House Waycrest were corrupted by the vile magics of the Drust King Gorak Tul, and sought to bring all of Kul Tiras under the power of the Drust. Lord Waycrest had fallen ill, and in her desperation Lady Waycrest made a pact with dark powers in order to keep him at his side - a deal which required her to form the Heartsbane Coven. The Heartsbane Coven used a twisted form of death-based Drust magic, which enslaved the minds of many of the region's best warriors as well as many of the common folk throughout the region. Drustvar is unique in Kul Tiras, in that there is a portion of the population who follow the Holy Light rather than Tideworship, and practice many mainlander traditions such as worshipping The Light at Chapels as places of worship rather than the Tide Shrines, and burying their dead in the ground rather than committing their bodies and spirits to the sea. House Stormsong controls Stormsong Valley to the north of Tiragarde Sound, where many of the best farmlands and shipyards are located. All seaworthy Kul Tiran vessels are blessed by the ancient order of Tidesages who commune with the sea to guide our legendary fleet. 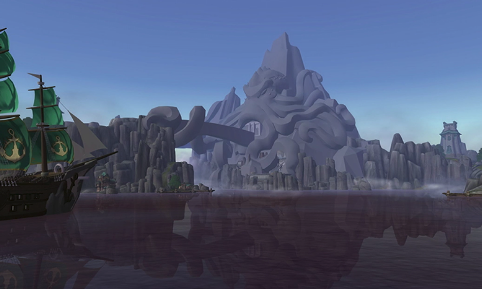 The region is at the center of the Kul Tiran religion of Tideworship, which pays reverence to the Sea and is the main religion in Kul Tiras. Lord Stormsong was recently corrupted by the forces of Lady Azshara, and had to be deposed and killed by Kul Tiran and Alliance forces. His nephew Brannon Stormsong is now the only living heir to House Stormsong, but is not yet ready to rule over the region due to his inexperience. The Storm's Wake, the sect of Tidesages who escaped Lady Azshara's corruption and remained loyal to Kul Tiras throughout the infighting within the Order of Tidesages, rule in his stead and advise the young Lord as he grows into this new role and learns the heavy weight of it's many responsibilities. Tidesages go to study the rituals and powers of the Sea.